Martyn Wyndham Read can charm an audience with the range and quality of his voice. One of the most frequently requested guests he has become a firm favourite at the club. 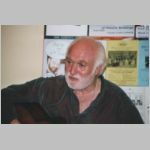 His love of Australian songs and stories is coupled with his love of traditional material and listen out for the occasional Graham Miles song. His fund of stories are delivered with a dry wit. Again, come early for a seat.